Sheets of ice on the trailer roof – no thank you! Severe accidents or dangerous situations for road users, pedestrians or for the driver himself arise as a result of failing to remove sheets of ice and lumps of snow from the vehicle roof. 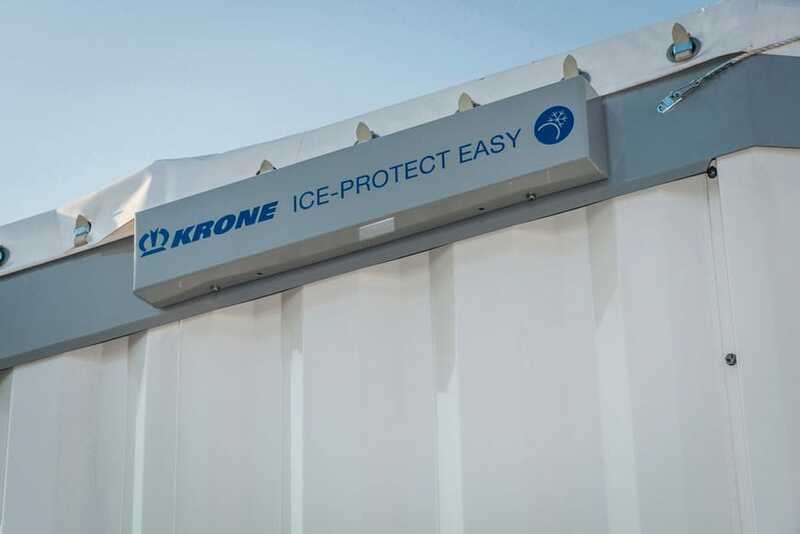 With Ice Protect Easy ® developed by Krone, such potentially dangerous situations can be avoided even more easily in the future. The new Ice Protect Easy System is activated by an electric motor; the motor actuates a mechanical hoisting device that is located under a tarpaulin on the trailer roof. By means of wire brackets, which are positioned between transverse hoops and interconnected, the roof tarpaulin is quickly raised by approx. 18 cm. Therefore, water can no longer accumulate on the roof and dangerous sheets of ice can no longer form. Compared to the previous Ice Protect with air hoses, another advantage of the new Ice Protect Easy system is improved service-friendliness and greater sturdiness. Furthermore, the vehicle can also be parked for longer periods of time without any problems or risk of the hoisting device being lowered. Furthermore, the trailer roof tarpaulin can be easily opened even when the Ice Protect Easy device is raised.